What is turbinado sugar? It is the sugar which is also known as "sugar in the raw" and is the pure cane sugar extract. The technique involves spinning the sugar in a cylinder or a turbine. Turbinado sugar looks like brown sugar in appearance, but it is paler and has a subtle molasses flavor. One teaspoon of Turbinado sugar contains 20 calories and 5 grams complex carbohydrates. Turbinado sugar has more moisture content than regular white or brown sugar and is usually used as a replacement for brown sugar in recipes like cookies and muffins. If the recipe has other ingredients which have high moisture content, regular sugar shouldn’t be replaced with turbinado sugar, because the latter might make the product too wet and soggy. If you are keen on using turbinado sugar, you can reduce the other ingredients which have high moisture content or use lesser quantity of the sugar. The recipe will require some experiences to get the right product with correct balance. Turbinado sugar is used in graham cracker pie-crusts and is also used as a topping on cinnamon cookies and toast. Since the sugar has property of caramelizing well, it is used by chefs on crème caramel. Owing to the high moisture content, it should be stored in air-tight containers to prevent hardening caused due to exposure to air. To make turbinado sugar, juice is firstly extracted from sugar cane and then the remaining water is evaporated by slowly heating. This process causes crystallization of the juice. The crystals formed are put in turbines or centrifuges to spin, which dries the product further. Compared to turbinado sugar, when white sugar is created, it undergoes more processing by decolorizing filter which removes it natural color. And brown sugar has molasses which add the brown color back it. It is easy to mistake turbinado sugar with brown color since they are brown in color. However, turbinado sugar is medium brown and has large crystals as compared to traditional brown sugar, which is light brown in color. Brown sugar is just like white sugar with added thin layer of molasses. It cannot be called unprocessed sugar, even though it is removed just before the processing is completely ended. 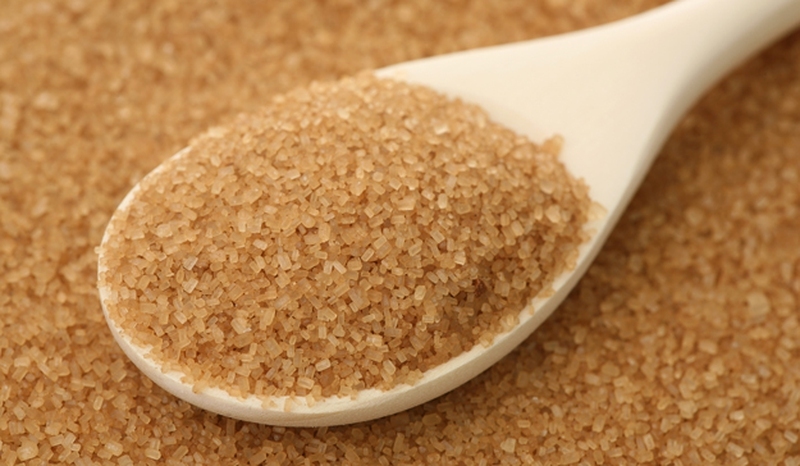 Only trace amounts of minerals present in the molasses are present in the brown sugar. Since the amount is so low, it is not enough to be considered beneficial to the body. Turbinado sugar is made from the first pressing of the sugar cane. It can be referred to as unprocessed sugar, since the sugar is formed before processing is completed. It has more natural molasses content in the crystals. So it should be used with care when adding the turbinado sugars to a recipe. Server responsed at: 04/19/2019 8:31 a.m.